New IDF campaign focuses on soldiers in railway stations, warns them not to talk about military matters. 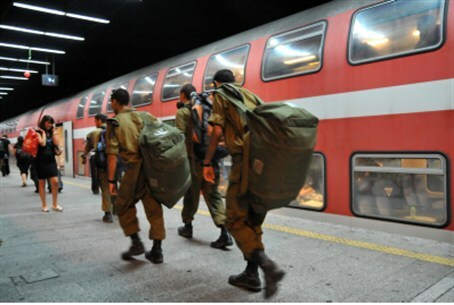 The IDF's Information Security Department is warning soldiers traveling on railways not to discuss military matters, out of concern that the enemy could be listening. A new advertising campaign focusing on this matter will be aimed at officers, soldiers and reservists in the railway stations. According to the Information Security Department, "The leak potential of information from the military is growing, along with the value of the information, so that the challenge of safeguarding the knowledge at this time is becoming a meaningful one." A senior source in the department explained Tuesday that the technological revolution which enables global connectivity and accessible information transfer, coupled with the evolution of social networks, as well as processes in the strategic arena, have forced the IDF to clarify the regulations governing discretion. "The motivation for collecting information against the IDF has grown, mainly through listening to cellphones and through the cyberworld," the source said. "In the past you needed a spy to physically enter an office to steal a folder with information. Today, much more can be stolen without even entering a room. "Nowadays a soldier can very easily reveal classified information through the internet, purposely or by mistake, and cause the IDF grave damage." The Information Security Department has improved its capacity to monitor and identify information breaches, as well as its ability to minimize damage once a breach has been identified.